In February, town negotiators gave CUPE local 1188 what it described as a “final offer” apparently ending talks with the town’s 35 inside and outside workers. The negotiations were being conducted with the help of a provincially appointed conciliator. CUPE national representative Marcos Salib says the union wants to return to the bargaining table to resolve the one main issue that is still outstanding, the question of whether the town should be required to consider seniority when a part-time or temporary worker applies for a permanent position. “Seniority issues are the foundation of unions,” Salib told Warktimes adding that the union would seek an opportunity to speak to councillors at their next meeting in April. However, during the question period held after Monday’s council meeting, Mayor Higham said councillors support the town’s position. The mayor went on to say there are misconceptions about the wording in the offer. Although talks appear to have broken down, the conciliator has not yet submitted a report to the provincial minister of labour declaring an impasse. As a result, there are still a number of steps before workers could legally strike or the town could lock out its employees. At last night’s meeting, town council unanimously adopted a social media policy designed to promote the use of media such as Twitter, Facebook and Instagram to publicize town activities and communicate with the public. At the same time, the new policy says town employees and elected officials should not use social media in ways that might undermine public trust or harm the town’s reputation. Among other things, the policy prohibits employees or elected officials from using town social media platforms to engage in personal attacks, comment on political campaigns or engage in commercial activities not related to town business. However, Mayor Higham acknowledged that while the policy will be enforced against municipal employees, there’s no way yet to force elected officials to comply. “The staff wrote the policy giving guidelines to council over how they should consider conducting themselves,” the mayor said. “It’s a difficult topic because there are legal rights attached to [council] positions and we have to sort through what types of measures would actually be viable,” he added. Councillor Bill Evans, who moved that council adopt the new policy, said he’s always been concerned about the fact that once councillors are elected they can get away with doing a bad job for four years, until the next election. Evans added that councillors could police the policy themselves by calling public attention to any violations. “I think public shaming is an effective way to deal with it,” he said. 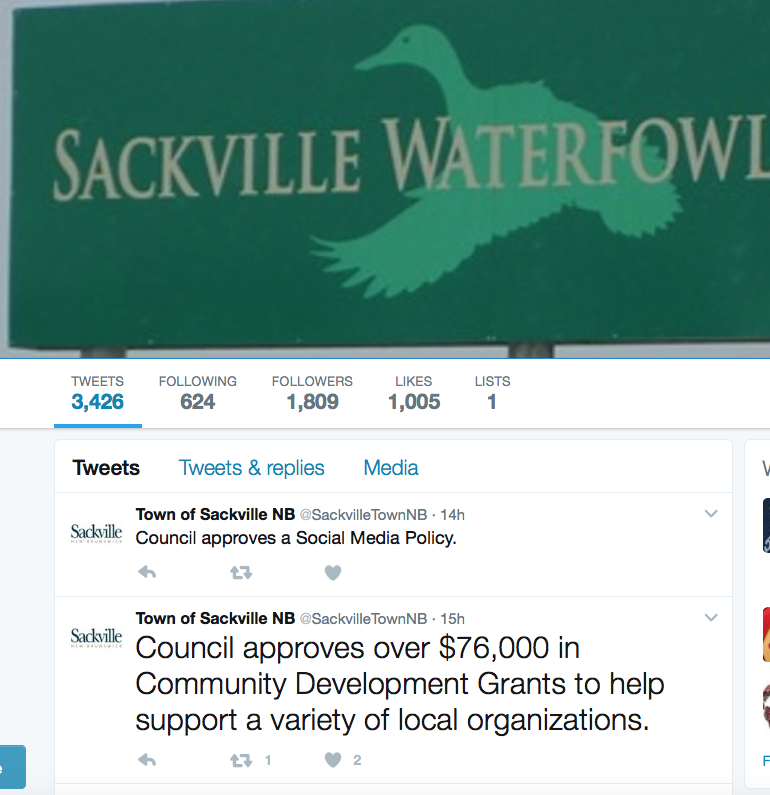 This entry was posted in Town of Sackville and tagged Bill Evans, CUPE local 1188, John Higham, Marcos Salib, social media policy. Bookmark the permalink. The Mayor’s comments in question period about “membership to have the opportunity to look at what’s actually in that final offer as opposed to what they’re being told is in the final offer” looks like the employer using the council forum to divide union members from their union. The Mayor should leave internal union business to the union and its members, and return to bargaining. I can not believe in the last year of this council and their decisions that there are so many professionals in every thing they vote on.